Travelpro, the original inventor of Rollaboard luggage and a leader in innovative, high-quality luggage design, is proud to announce its “Win A Trip to Las Vegas Sweepstakes” in celebration of the upcoming Sony Pictures’ motion picture comedy “Paul Blart: Mall Cop 2,” in theaters April 17, 2015. The Sweepstakes winner and a guest will fly roundtrip and stay at the Forbes Travel Guide Five-Star Wynn Las Vegas resort. In addition, the winner will experience Le Rêve –The Dream, the aquatic and aerial theatrical production named Best Show in Las Vegas for four consecutive years, presented exclusively at Wynn Las Vegas. Additionally, the winner will receive two pieces of Travelpro luggage. Look for Travelpro luggage in the movie and at retailers nationwide and online. The sweepstakes runs from March 20 through May 1. To enter, simply register at www.travelpro.com/mallcop-sweepstakes. Visit this same site to view the complete sweepstakes official rules. No purchase is required to enter the sweepstakes. Void where prohibited. For over 25 years, Travelpro International has prided itself on design innovation and durability in crafting the highest quality luggage for travelers worldwide. Since transforming the ease of modern day travel with The Original Rollaboard wheeled luggage, Travelpro has been the brand of choice for flight crews and frequent travelers worldwide. Travelpro is dedicated to building a lifelong relationship with its customers by consistently understanding and exceeding their needs. Travelpro was honored to once again be voted as the “World’s Best Luggage” by Premier Traveler Magazine in 2014. 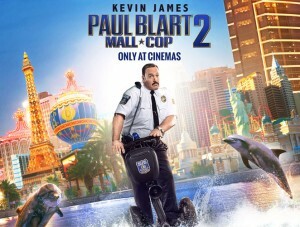 After six years of keeping our malls safe, Paul Blart has earned a well-deserved vacation. He heads to Vegas with his teenage daughter before she heads off to college. 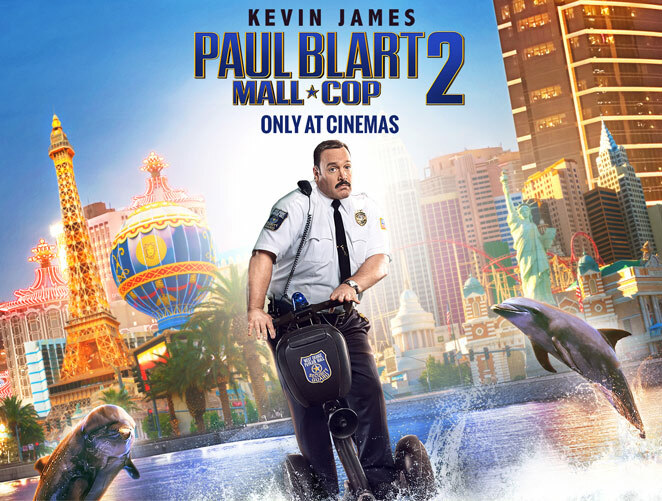 But safety never takes a holiday and when duty calls, Blart answers. Directed by Andy Fickman. Produced by Todd Garner, Kevin James, Adam Sandler and Jack Giarraputo. Written by Kevin James & Nick Bakay. Wynn and Encore Las Vegas are two luxury hotel and casino resorts on the Las Vegas Strip. The iconic travel destinations are operated by international resort developer Wynn Resorts, recipient of more Forbes Travel Guide Five Star Awards than any other independent hotel company in the world. Wynn Las Vegas opened on April 28, 2005 and has been recognized as the best resort in Nevada on Condé Nast Traveler’s “Gold List” for six consecutive years. The resort features 2,714 lavish guest rooms and suites, more than 111,000 square feet of state-of-the-art casino space, 14 casual and fine dining restaurants, a spa and salon and an on-site Ferrari and Maserati dealership and 18-hole golf course. Wynn Las Vegas is home to Le Rêve – The Dream, the aquatic and aerial theatrical experience named Best Show in Las Vegas for four consecutive years, and Steve Wynn’s ShowStoppers, a production with 35 singers and dancers and a full 31-piece on-stage orchestra composed of quintessential numbers from some of the most celebrated composers and lyricists to ever grace American theater stages. Encore, an expansion of Wynn Las Vegas, opened on Dec. 22, 2008. Featuring an additional 2,034 all-suite accommodations, a 72,000-square-foot casino, five restaurants and a spa and salon, Encore is located adjacent to Wynn Las Vegas. Combined, the two resorts boast four distinct nightlife and day club experiences, approximately 283,000 square feet of meeting space and 98,000 square feet of retail space. For more information on Wynn and Encore Las Vegas, visit www.wynnpressroom.com, follow on Twitter and Instagram at @WynnLasVegas and www.facebook.com/wynnlasvegas. (Boca Raton, Fla.)—Travelpro, the original inventor of Rollaboard luggage and a leader in innovative, high-quality luggage design, is proud to announce its “Win A Trip to Vegas” sweepstakes in celebration of the upcoming CBS Films’ motion picture comedy “LAST VEGAS,” in theaters November 1, 2013. Starring four Hollywood legends like you’ve never seen them before, “LAST VEGAS” tells the story of Billy, Paddy, Archie and Sam (played by Academy-Award winners Michael Douglas, Robert De Niro, Morgan Freeman and Kevin Kline), best friends since childhood. When Billy, the group’s sworn bachelor, finally proposes to his thirty-something (of course) girlfriend, the four head to Las Vegas with a plan to stop acting their age and relive their glory days. However, upon arriving, the four quickly realize that the decades have transformed Sin City and tested their friendship in ways they never imagined. The Rat Pack may have once played the Sands and Cirque du Soleil may now rule the Strip, but it’s these four who are taking over Vegas. Directed by Jon Turteltaub (National Treasure, While You Were Sleeping) from a screenplay by Dan Fogelman (Crazy, Stupid, Love; Tangled), “LAST VEGAS” co-stars Oscar-winner Mary Steenburgen (The Help), Jerry Ferrara (Think Like A Man), Romany Malco (Weeds) and Roger Bart (Political Animals). To learn more about the film and see the trailer, go to the Last Vegas movie website. The Sweepstakes winner and guest will fly roundtrip and stay at the fabulous ARIA Resort & Casino and see Zarkana by Cirque du Soleil, presented exclusively at ARIA Resort & Casino, and featured in “LAST VEGAS.” Additionally, the winner will receive two pieces of Travelpro luggage. Look for Travelpro luggage in the movie and at retailers nationwide and online. The sweepstakes runs from October 16 through December 2. 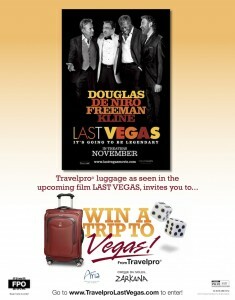 To enter, simply register at TravelproLastVegas.com. Visit this same site to view the complete sweepstakes official rules. No purchase is required to enter the sweepstakes. Travelpro’s “Last Vegas” promotional and product placement deal was developed by LINK Entertainment Marketing, the leader in connecting brands with the emotional engagement delivered through the power and storytelling of entertainment. For twenty five years, Travelpro International has prided itself on design innovation and durability in crafting the highest quality luggage for travelers worldwide. Since transforming the ease of modern day travel with The Original Rollaboard wheeled luggage, Travelpro has been the brand of choice for flight crews and frequent travelers worldwide. Travelpro is dedicated to building a lifelong relationship with its customers by consistently understanding and exceeding their needs. Travelpro was honored to receive the New Product Innovation Award from the Travel Goods Association (TGA) in March 2013 for the revolutionary Platinum Magna luggage collection. Travelpro, the original inventor of Rollaboard luggage and a leader in innovative, high-quality luggage design, is proud to announce its “Win A Trip to Hollywood” sweepstakes in celebration of the upcoming Fox Searchlight Pictures romantic-comedy, “Baggage Claim,” directed by David E. Talbert. “Baggage Claim” follows determined flight attendant, Montana Moore (Paula Patton), who pledges to get engaged before her youngest sister’s upcoming wedding. Finding herself with only 30 days to find Mr. Right, Montana uses her airline connections to “accidentally” meet up with eligible ex-boyfriends and scour for potential candidates. She racks up more than 30,000 miles and countless comedic encounters, all the while searching for the perfect guy. Written and directed by David E. Talbert, based on his book, and produced by Steven J. Wolfe and David E. Talbert, the film also stars Derek Luke, Taye Diggs, Jill Scott, Boris Kodjoe, Adam Brody and Djimon Hounsou. Be sure to keep a lookout for Travelpro Luggage when “Baggage Claim” comes to a theatre near you on September 27th, 2013. To learn more about the film and see the trailer, go to the Fox Searchlight website. Travelpro will also provide two Travelpro carry-on suitcases as part of the prize package. The sweepstakes runs from August 26 through September 27. To enter, simply register at the contest site, TravelproBaggageClaim.com. Visit this same site to view the complete sweepstakes official rules. No purchase is required to enter the sweepstakes. Travelpro International’s “Baggage Claim” promotional and product placement deal was developed by LINK Entertainment Marketing, the leader in connecting brands with the emotional engagement delivered through the power and storytelling of entertainment. For twenty five years, Travelpro International has prided itself on design innovation and durability in crafting the highest quality luggage for travellers worldwide. Since transforming the ease of modern day travel with The Original Rollaboard wheeled luggage, Travelpro has been the brand of choice for flight crews and frequent travelers worldwide. Travelpro is dedicated to building a lifelong relationship with its customers by consistently understanding and exceeding their needs. Travelpro was honored to receive the New Product Innovation Award from the Travel Goods Association (TGA) in March 2013 for the revolutionary Platinum Magna™ luggage collection. Travelpro, the original inventor of Rollaboard luggage and a leader in innovative, high-quality luggage design, is proud to announce that its Travelpro, Atlantic and National Geographic luggage collections along with Austin House travel accessories will be featured in the upcoming CBS Films’ comedy “Last Vegas,” in theaters November 1, 2013. Starring four legends like you’ve never seen them before, LAST VEGAS tells the story of Billy, Paddy, Archie and Sam (played by Academy Award winners Michael Douglas, Robert De Niro, Morgan Freeman and Kevin Kline), best friends since childhood. When Billy, the group’s sworn bachelor, finally proposes to his thirty-something (of course) girlfriend, the four head to Las Vegas with a plan to stop acting their age and relive their glory days. However, upon arriving, the four quickly realize that the decades have transformed Sin City and tested their friendship in ways they never imagined. The Rat Pack may have once played the Sands and Cirque du Soleil may now rule the Strip, but it’s these four who are taking over Vegas. Directed by Jon Turteltaub (National Treasure, While You Were Sleeping) from a screenplay by Dan Fogelman (Crazy, Stupid, Love; Tangled), “Last Vegas” co-stars Oscar-winner Mary Steenburgen (The Help), Jerry Ferrara (Think Like A Man), Romany Malco (Weeds) and Roger Bart (Political Animals). Be sure to keep a lookout for Travelpro Luggage when “Last Vegas” comes to a theatre near you on November 1, 2013. Travelpro’s “Last Vegas” promotional and product placement deal was developed by Entertainment Marketing, the leader in connecting brands with the emotional engagement delivered through the power and storytelling of entertainment. To learn more about the film and see the trailer, go to lastvegas-movie.com. Boca Raton, Fla.—Travelpro, the original inventor of Rollaboard luggage and a leader in innovative, high-quality luggage design, is proud to feature Travelpro, Atlantic and National Geographic luggage collections along with Austin House travel accessories in the upcoming romantic comedy “Baggage Claim” presented by Fox Searchlight Pictures. Written and directed by David E. Talbert, based on his book, and produced by Steven J. Wolfe and David E. Talbert, the film also stars Derek Luke, Taye Diggs, Jill Scott, Boris Kodjoe, Adam Brody and Djimon Hounsou. Be sure to keep a lookout for Travelpro Luggage when “Baggage Claim” comes to a theatre near you on September 27th, 2013. To learn more about the film and see the trailer, go to the Baggage Claim movie website. For twenty five years, Travelpro International has prided itself on design innovation and durability in crafting the highest quality luggage for travelers worldwide. Since transforming the ease of modern day travel with The Original Rollaboard wheeled luggage, Travelpro has been the brand of choice for flight crews and frequent travelers worldwide. Travelpro is dedicated to building a lifelong relationship with its customers by consistently understanding and exceeding their needs. Travelpro was honored to receive the New Product Innovation Award from the Travel Goods Association (TGA) in March 2013 for the revolutionary Platinum Magna™ luggage collection. Please visit the Travelpro website for a full list of the latest products and retail locations. Follow us on Facebook and on Twitter at @TravelproIntl. When you’re filming a movie about the ultimate frequent flier which stars George Clooney, only A-List props will do. And when Clooney played a corporate downsizing expert who travels 322 days per year and prides himself on quickly and effortlessly navigating airports, his rollaboard luggage must be the best the industry has to offer. Recognizing that checking bags add an average of 35 minutes to each flight (not to mention the $20 – $25 checked bag fee), Clooney’s character, Ryan Bingham, chose to carry-on his Travelpro® Crew Rollaboard luggage, which accommodated everything he needed for his endless business trips. As a professional traveler, Bingham used Travelpro Crew luggage that featured sealed ball-bearing wheels and a locking retractable handle system to streamline his commute through an endless number of terminals and hotel lobbies. As he prepared for the next leg of his many trips, he enjoyed the benefit of wrinkle-free packing with his removable suiter. Bingham’s fellow “road warrior” and love interest in the film, Alex Goran (played by Vera Farmiga) preferred the fashionable Platinum® 6 carry-on which features beautiful chrome accents and lustrous two-tone ballistic nylon fabric coated with Teflon®. In one the film’s funniest scenes, Bingham mentored Junior Executive Natalie Keener (played by Anna Kendrick) on the art of packing for a business trip. At the airport, Natalie was forced to replace her antiquated suitcase and remove a large number of unessential items. She was escorted to the Travelpro luggage store by Ryan Bingham where she purchased a new Platinum 6 carry-on. Then she received a lesson on how to properly pack her remaining garments by the master himself. An expertly packed rollaboard carry-on became one of the film’s key characters. For over two decades, Travelpro has prided itself on design innovation and durability in crafting the highest quality luggage for travelers across the globe. Since transforming the ease of modern day travel with The Original Rollaboard® wheeled luggage, Travelpro has been the brand of choice for flight crews and frequent travelers worldwide.